The Sassy Apron – Cheers to the sweet life! Cheers to the sweet life! I feel like I’m not alone when I say I could eat an entire package of Oreos and still want more (and if you disagree, then that’s probably why we’re not friends). Despite Nabisco’s attempt to branch out, most of their newer flavors have fallen short in my opinion. With the exception of the Red Velvet and Pumpkin Spice, I’m not tempted at all by the others. I really don’t get this Oreo Thins business. Don’t kid yourself. Oreo Thins will never make you as happy as the original Double Stuf. With National Cheesecake Day coming up this Saturday, July 30th, I figured it needed to be celebrated appropriately. When I came across a recipe for Oreo Cheesecake Bites from Six Sisters’ Stuff I knew I had a winner. It wasn’t until I was at the store facing the massive spread of Oreo flavors that I had a stroke of genius and grabbed the Red Velvet Oreos. This was probably the best decision I made all week. Maybe all month. These squares are perfect to take to a party or to any event because they are bite sized and so cute! This is also an extremely easy recipe that doesn’t require much decorating. Fair warning- it’s hard to stop after one. Enjoy and happy National Cheesecake Day! Preheat oven to 325*. Line a 13×9″ baking dish with foil, with the foil going up and over the sides. Crush one package of Oreos either by using a food processor or by hand. Food processor definitely cuts down on time! The smaller pieces the better. In a separate bowl mix the 1/4 cup of melted butter with the crushed oreos. Press this mixture into the pan, creating your crust. 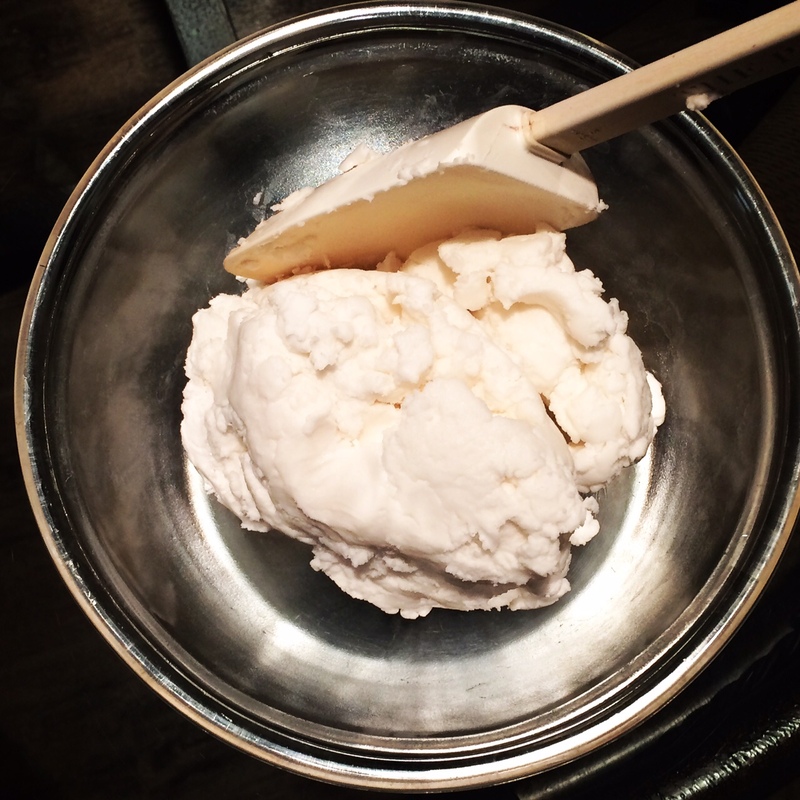 In a mixer beat the cream cheese until it becomes smooth. Add the sugar, sour cream, and vanilla. Add the eggs one at a time, mixing after each addition. Pour mixture of the crust and bake for 45 minutes. After you take the cheesecake out of the oven, let it set for a couple of hours. You can put it in the fridge if you need to speed up this process. Once the cheesecake is set, cut into squares and spread them out on wax paper. Melt the white candy coating and drizzle it over the top of the squares. Happy National Cheesecake Day! The beginning of February is such a different song from the beginning of January. We go from resolutions and committing to healthier lifestyles to celebrating Mardi Gras, the end of another football season, and Valentine’s Day. Basically food, food, and more food. It’s awesome. I entertained the idea of making a King Cake from scratch for about 7 minutes. Maybe one day, but time is precious. For the sake of my sanity I opted to make a King Cake inspired dessert instead. You might remember my King Cake cupcakes from a couple of years ago. Using the same recipe I changed up the presentation and created these little bite sized delights. What I LOVE about these King Cake Bites: they’re bite sized and perfect for parties, bringing to the office, or a snack for your kids. They are also super easy (time saver!) and if you have kids this is definitely something they could help bake! Preheat oven to 350*. Cream together the ingredients for the filling. Separate dough into 8 rectangles (sealing the seams if you’re not using seamless). Sprinkle cinnamon over each rectangle. Spread the cream cheese mixture onto each rectangle- make sure you completely cover it length wise (it’s not necessary to cover it edge to edge across the width of it). Fold the rectangles length wise into thirds, keeping the seam side down. Cut each rectangle into four squares. Pinch together the ends to keep the filling in while it bakes. 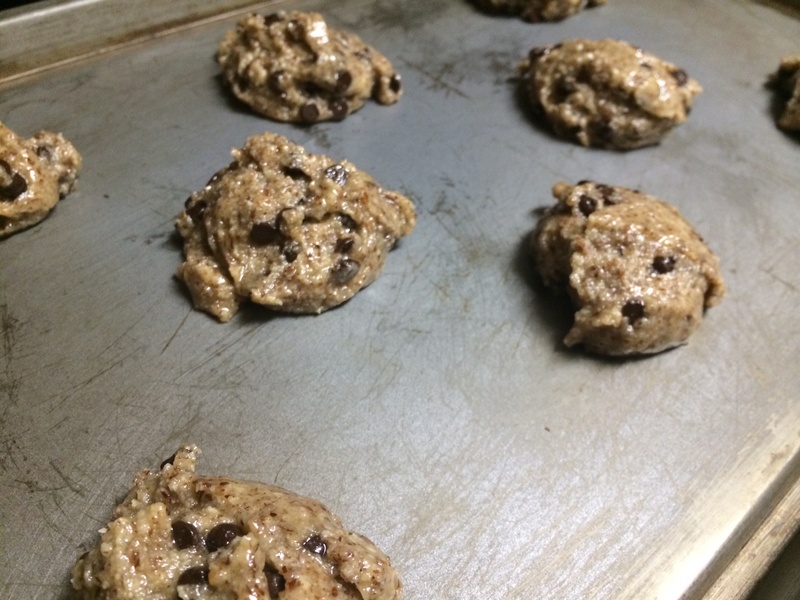 Place on a greased cookie sheet and bake for 12 minutes, until golden. Make the glaze while the bites cool. To make the glaze mix all the ingredients in a bowl. Spoon over the bites, adding purple, yellow, and green sprinkles on top. Enjoy!! Since my last post I went on vacation for about three weeks. I’m not telling you this to make you jealous- it sets up the story of the recipe I’m posting this week. I spent two weeks in Croatia and then jetted off to California a few days after I got back. Both amazing trips, but after three weeks of being gone I was ready to be back home! Obviously I had to completely clean out my pantry and refrigerator before I left so I wouldn’t have new things growing in my kitchen when I came back. This is what brings me to this recipe. If you’re wondering why I would have cake mix when I bake all my cakes from scratch, it’s because I have a habit of buying cake mix when it’s on sale. One of my parents told me once that they do that (I can’t remember which one!) and it’s just something that I picked up on. You never know when you might need some! I couldn’t make a cake or cupcakes because I didn’t have anything to make frosting. I narrowed my search to cookies and found this recipe at Cookies and Cups. They were incredibly easy to make and they disappeared FAST the next day! 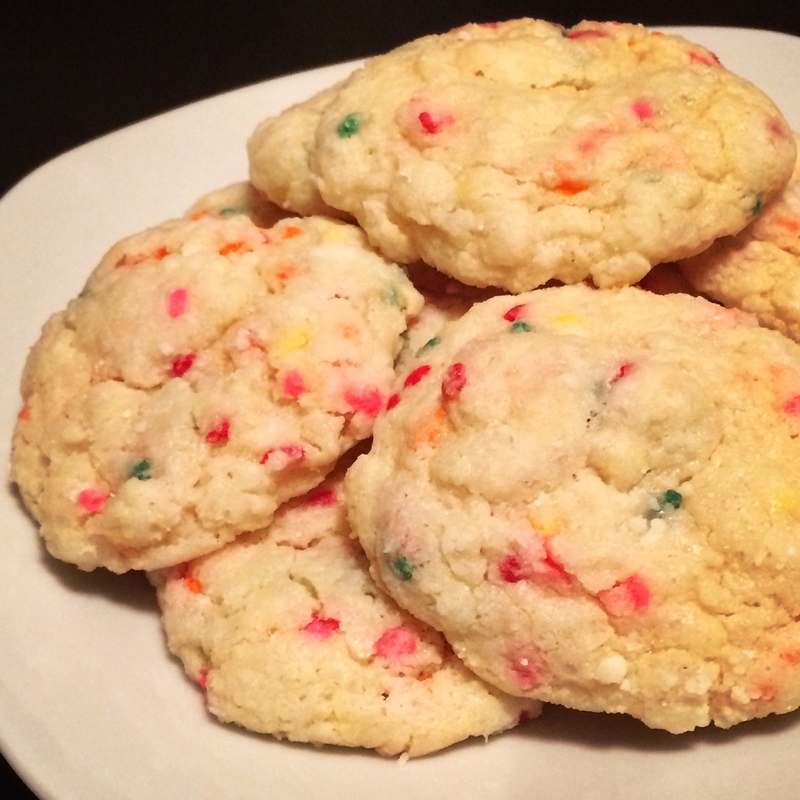 Funfetti is pretty hard to resist! I love the flavor that the cream cheese adds. These cookies are super light and fluffy and perfect for any get together! Cream the butter and cream cheese together. Add in the egg, mix to combine. 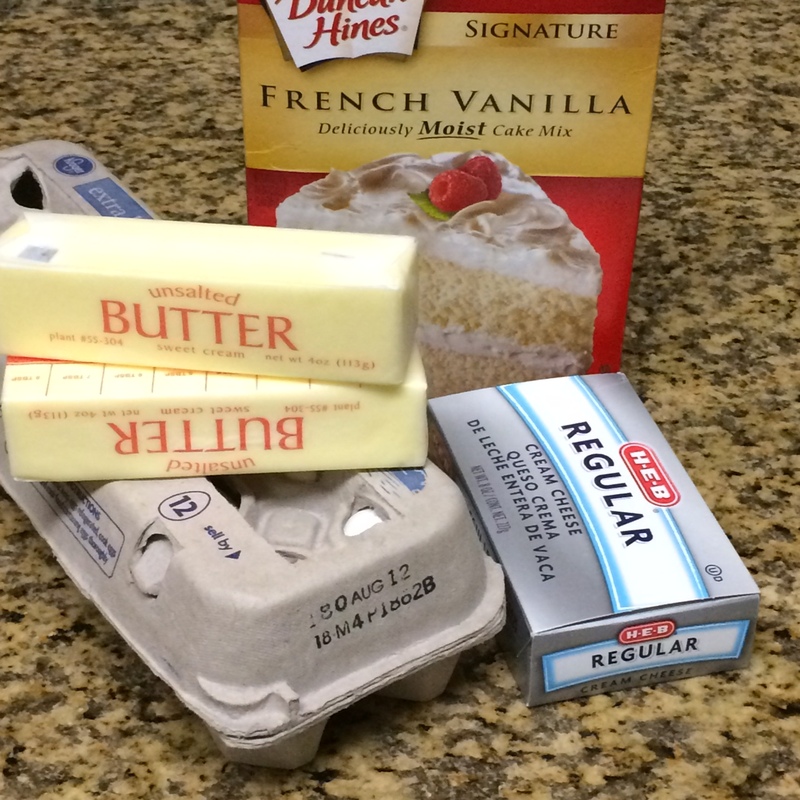 Gradually mix in the cake mix. Fold in the sprinkles. Refrigerate the dough for at least an hour (Mine was still pretty soft after this, you could also put it in the freezer to firm up the dough). Preheat the oven to 350*. Line baking sheet with parchment paper. Roll dough into 1″ balls and dip in the powdered sugar. Place balls at least 1″ apart on the baking sheet. Bake for 10 minutes. Let the cookies cool for a minute before moving them to a wire rack. Enjoy! Well. I was going to bypass any excuses and “oh wow it’s been awhile”…until I saw it’s been almost a YEAR since I last posted. My bad. Hope I get some credit for making it back before a full year passed. 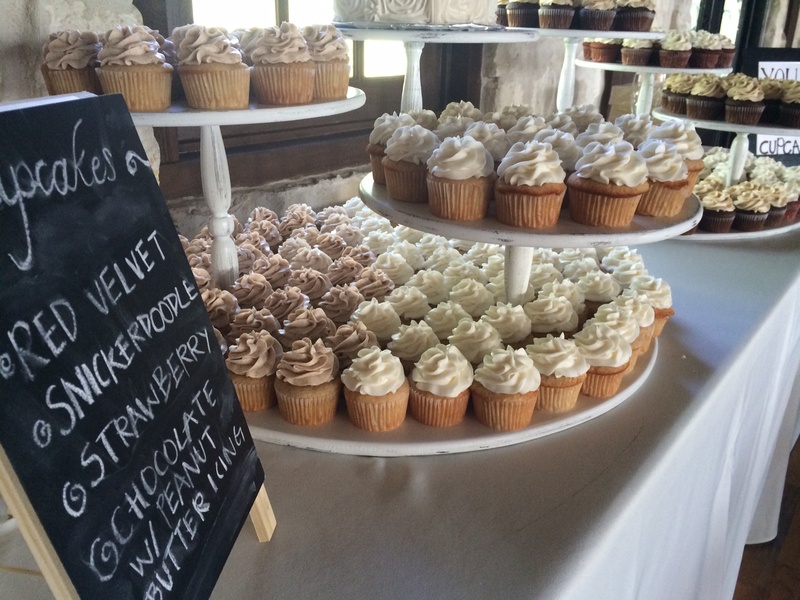 Maybe these cupcakes will distract you from that. When I was a kid I was an extremely picky eater (sorry mom and dad). I recall a particular snack time in preschool where I scraped the creme off of the Oreos to eat and gave the cookie to one of my friends. Of course I got in trouble for that and they cut me off. I still don’t understand that- I wasn’t wasting the cookies, someone was still eating them! Don’t worry, I’ve matured since then and will now eat the entire Oreo. My point is that I love the filling on Oreos. I’ve always thought that they should sell that stuff by the jar. Hold the cookies, please. 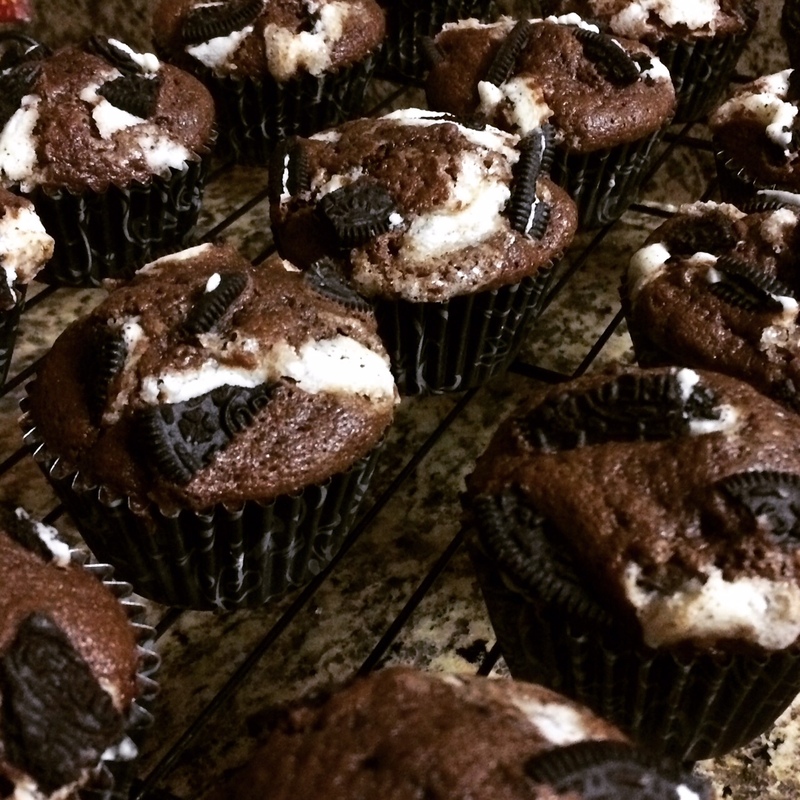 So when I was asked to make Oreo cupcakes this week I decided I would try to make my own Oreo creme. A quick google search provided several copycat recipes. Thank you, internet. 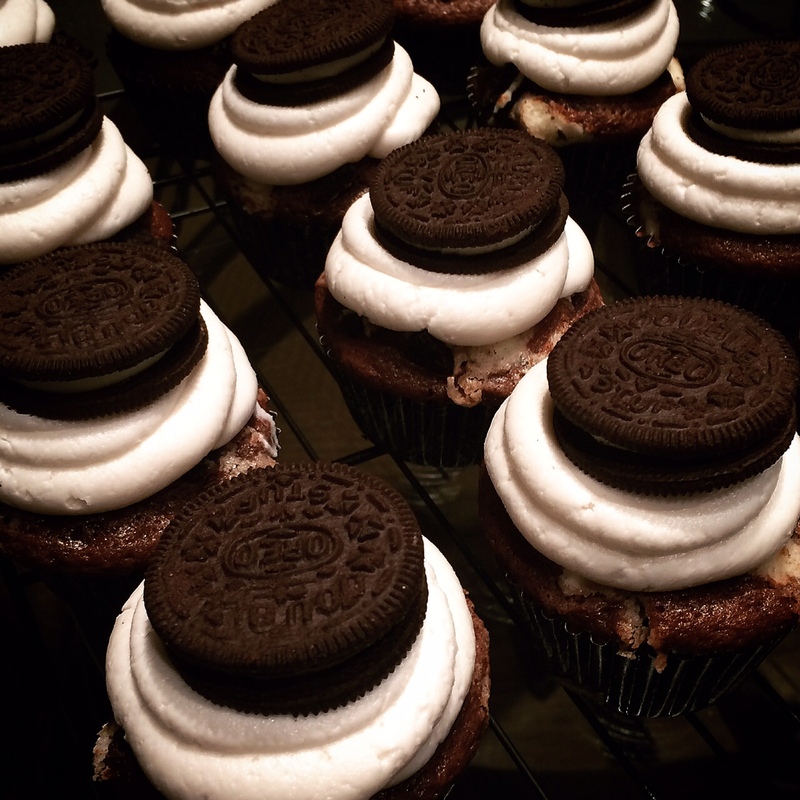 You will never have to buy Oreos again after making this. Unless you want the cookie. I will warn you- this filling is like crack and you will probably eat all of it in one sitting. Make these chocolate cupcakes. 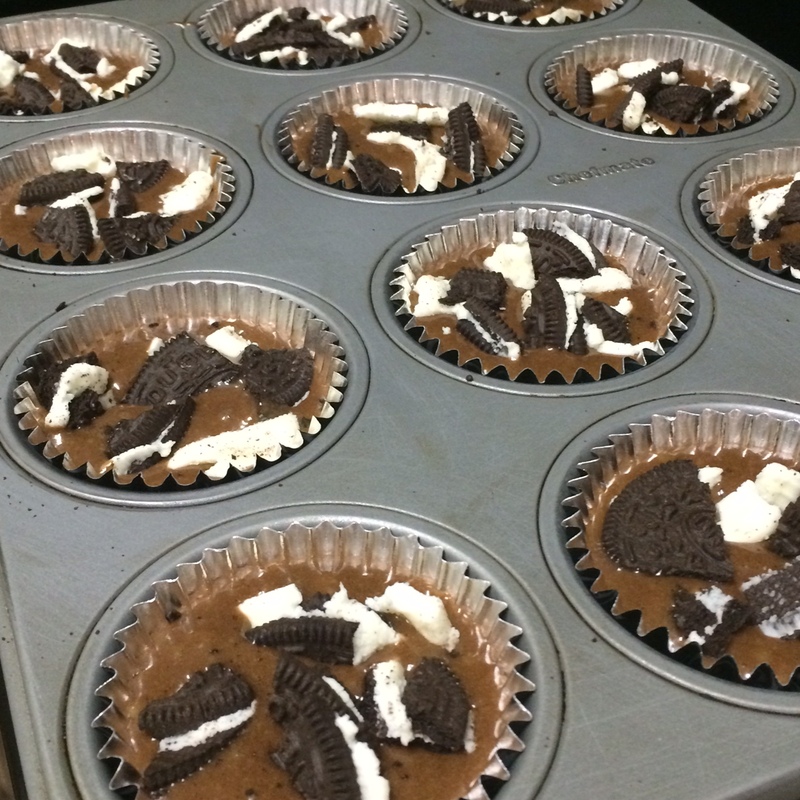 After pouring the batter into the cupcake tin, add in chunks of Oreos. I used Double Stuf. We don’t mess around in this kitchen. I pressed some of the pieces down just for good measure. Bake for 20 minutes at 350*. These cupcakes looked delicious coming out of the oven. Tempting to eat as is. But wait, we are not done! And here’s what you’ve been waiting for- Oreo filling! Seriously. Making this might be the highlight of my baking career. Cream the first four ingredients together. Gradually add the powdered sugar. The consistency will be thick, just like it is on the cookie. If you want Oreo creme then this is all you have to do. I needed to be able to pipe it onto cupcakes, so I had to thin it out. To do this I added 2 Tbsp. of hot water. It doesn’t take a lot of extra water, so add a tablespoon at a time until it reaches the consistency you need. This frosting should be enough for 2 dozen cupcakes. Pipe onto the cupcakes and top with an Oreo. Marvel at your creation, then devour it. On Sundays there’s a Spanish channel that plays Dexter reruns- that is, they play Dexter in English but the commercials are still in Spanish. It’s the best of both worlds; I get to watch Dexter and learn Spanish. Of course what I’ve learned is limited to selling you AT&T and why you should eat Taco Bell and Pizza Hut. I was in for a treat today though. Several years ago there were some clips from a comedian named Anjelah Johnson that floated around the interwebs, most notably the nail salon lady and Bon Qui Qui. Well apparently they have combined the two to create a music video- yes, a music video! And they played it during a commercial break. Bon Qui Qui has her own music video for a song called “No Boyfren”. Google it. You’re welcome. While that little gem should be enough for you, I highly doubt you came here just for that. This week I was approached by someone who saw my paleo chocolate chip cookies and was wondering if I could make them without eggs. 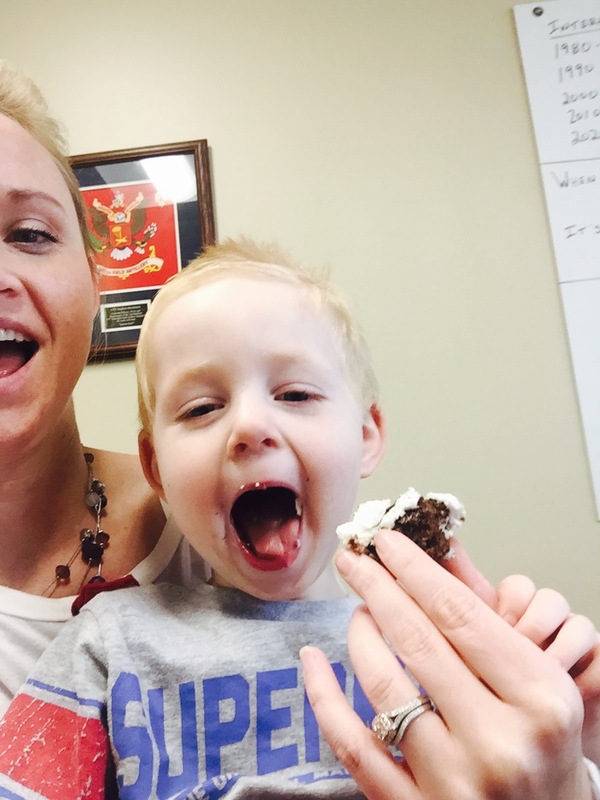 Her daughter is allergic to eggs (among other things) and has pretty strict diet restrictions. Most paleo baking relies on eggs to bind ingredients together since that’s usually a job for gluten. I did some searching and came across this recipe from Elana’s Pantry. I made a few adjustments based on the ingredients I had and was pretty pleased with the results. Preheat the oven to 350*. Mix the dry ingredients together in a bowl. Whisk the wet ingredients together in a separate bowl. Add the wet ingredients to the dry ingredients and mix until combined. Fold in chocolate chips. I did this all by hand, I think an electric mixer might lead to over mixing. Use a cookie scoop to drop dough onto a cookie sheet. Bake for ~8 minutes. These are soft cookies, so if they look like they need a little more time to set (1-2 minutes) then leave them in for a little longer. Just don’t let them burn! 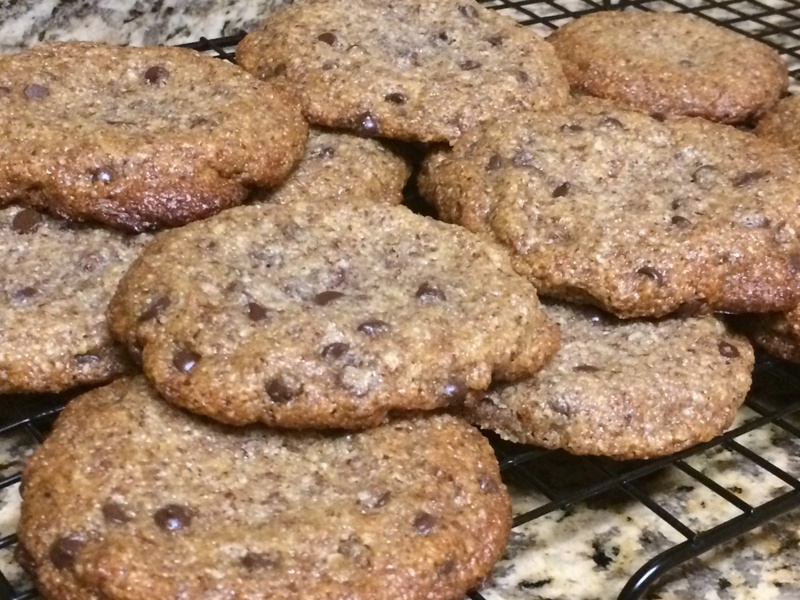 Let them cool for a minute or two on the cookie sheet before you move them to a cooling rack. They will firm up as they cool off. 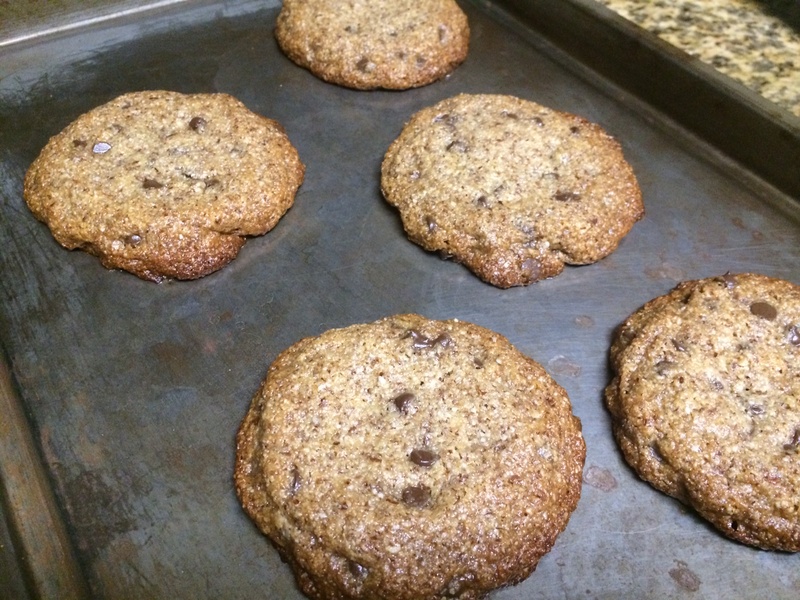 *If you read Elana’s Pantry’s recipe, she will say to not use Bob’s Red Mill almond flour. That happened to be what I had on hand, so that is what I used. My measurements are based on using that almond flour. 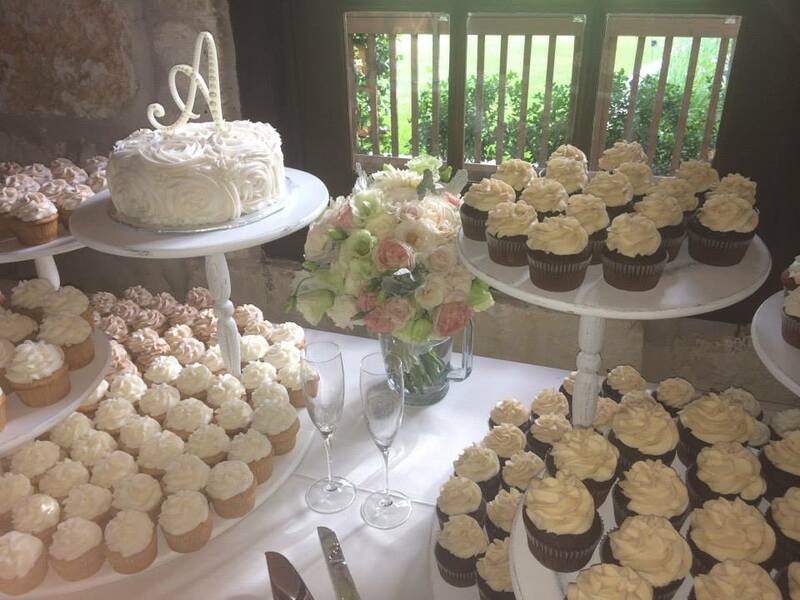 A couple of weekends ago, I had the pleasure of baking for another wedding. The bride’s family and mine have been friends for about 20 years now. There’s a long history of swim meets, 4th of July fireworks and homemade ice cream, and both of our families even moved around the same time to the same area when we were in junior high. And then we started over on a new swim team in the new neighborhood (see the central piece here?). After high school we continued to A&M, and then both became teachers- although in different cities. 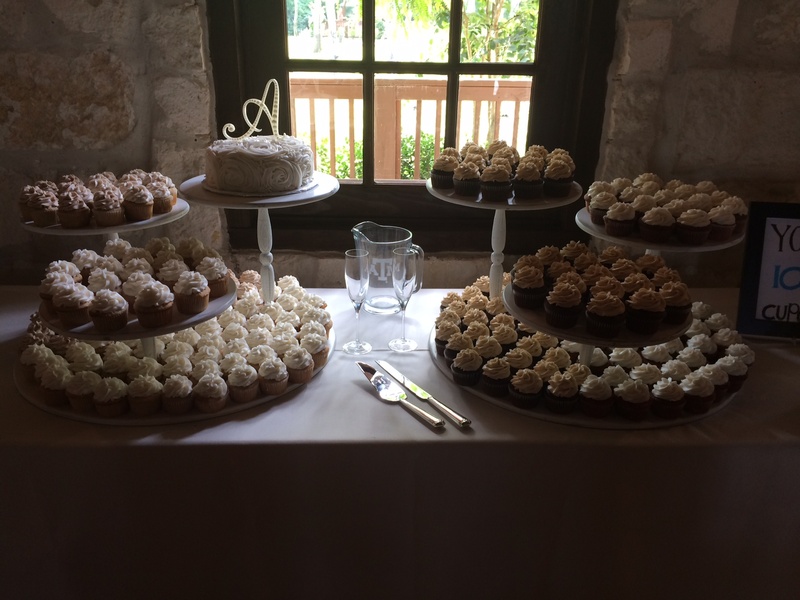 The couple wanted cupcakes and settled on four different flavors: strawberry, snickerdoodle, red velvet, and chocolate with peanut butter frosting. 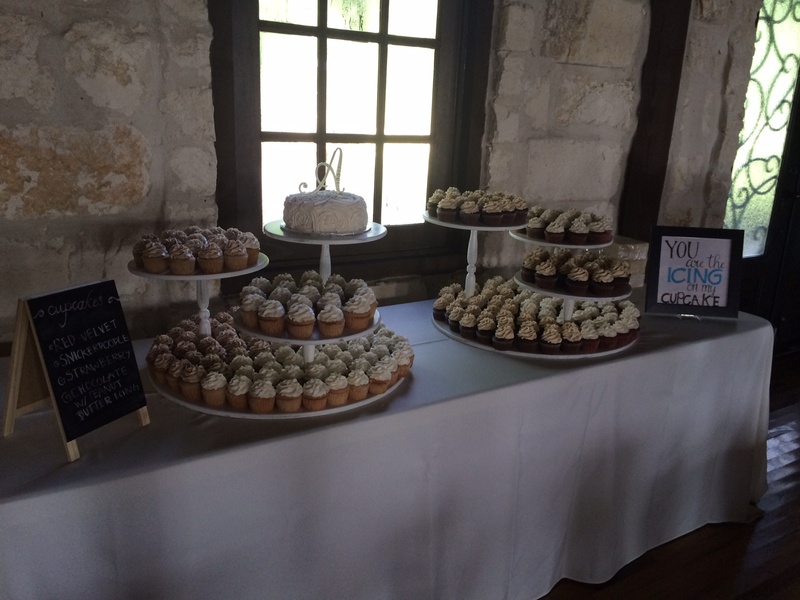 I don’t always get to watch people eat the cake after I set it up, so it was fun to watch the cupcakes disappear at the wedding. 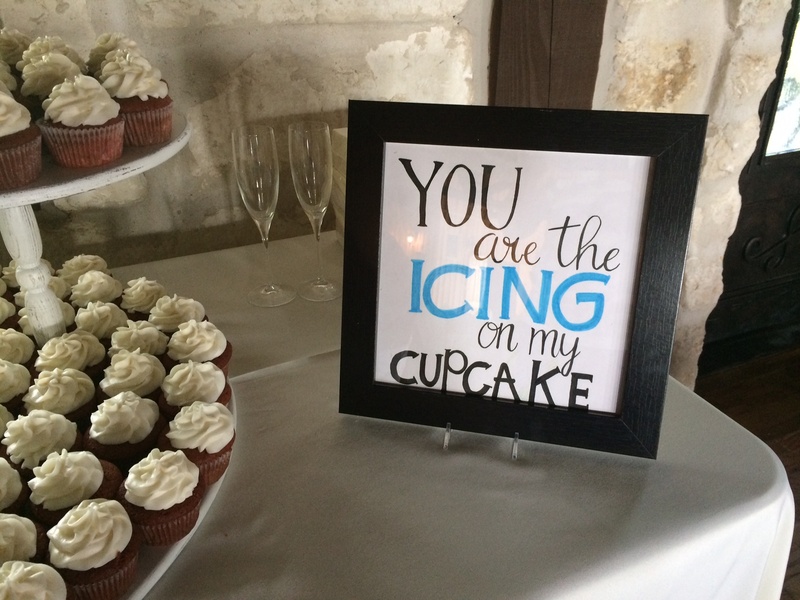 I wish I could take credit for the signs on the cake table, but that was all the bride’s doing. The entire wedding was absolute gorgeous and I loved being a part of it! For all my Aggies, the bride’s bouquet is in an A&M pitcher! I’m going to pretend like it hasn’t been a month or so since my last post. Because it’s now May. I feel like May kind of gets screwed because that’s when everyone starts counting down to summer. And by everyone, I mean students and teachers. That’s how I view May…a gateway to summer. 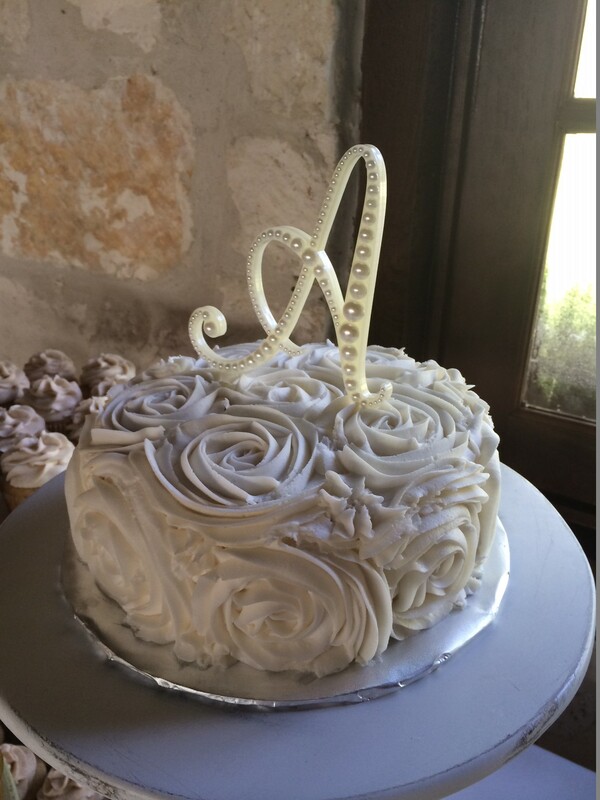 I had been baking every weekend since February and thought last weekend would be a little break…until I was approached with a cake request that was different from what I normally do. Of course I couldn’t say no. 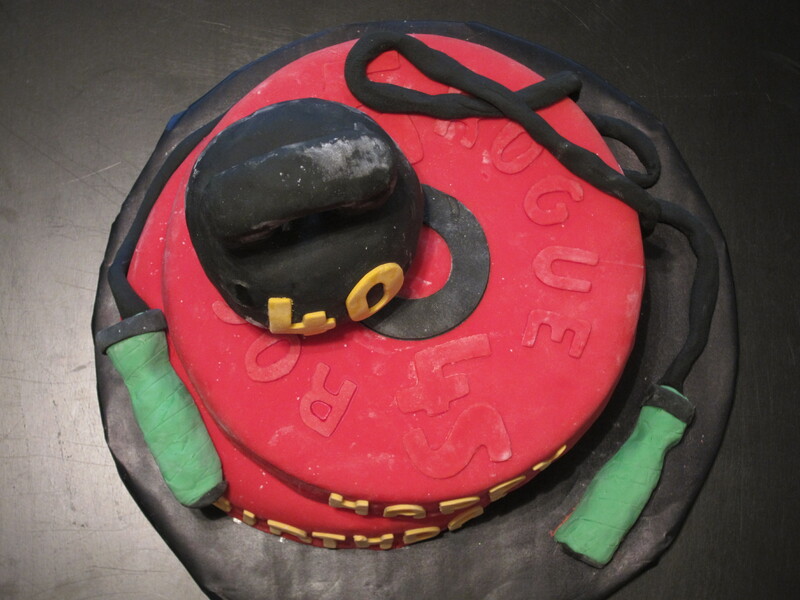 I was asked to do a CrossFit cake, which I’ve done before, but this one was all fondant. Now I know how to make fondant, and decorate with fondant and gumpaste. It’s just my personal opinion that it doesn’t taste that good and that regular frosting is better. Fondant usually wins in the looks department though (I guess that means buttercream has a great personality.) Anyways, I hadn’t made a fondant cake since I took a cake decorating class four years ago. I will say it is much easier to do fondant than pipe buttercream! First I made a kettlebell out of rice krispies treats. This was to go on top of the cake. It took me about 20 minutes to shape the rice krispies into a kettlebell, a lot less stressful than trying to make one with cake. I covered the bell and handle in fondant separately, and then attached the handle to the bell with toothpicks. 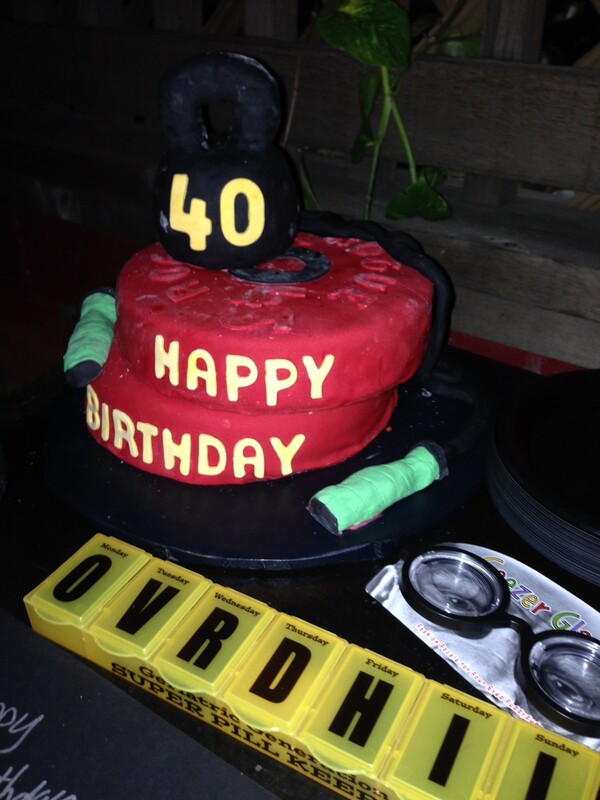 I cut out a 4-0 and glued it to the front (birthday boy was turning 40). Edible glue y’all…basically sugar water. I also made jump rope handles out of gumpaste. I did all of this the day before I made the cake, so it would have time to set. 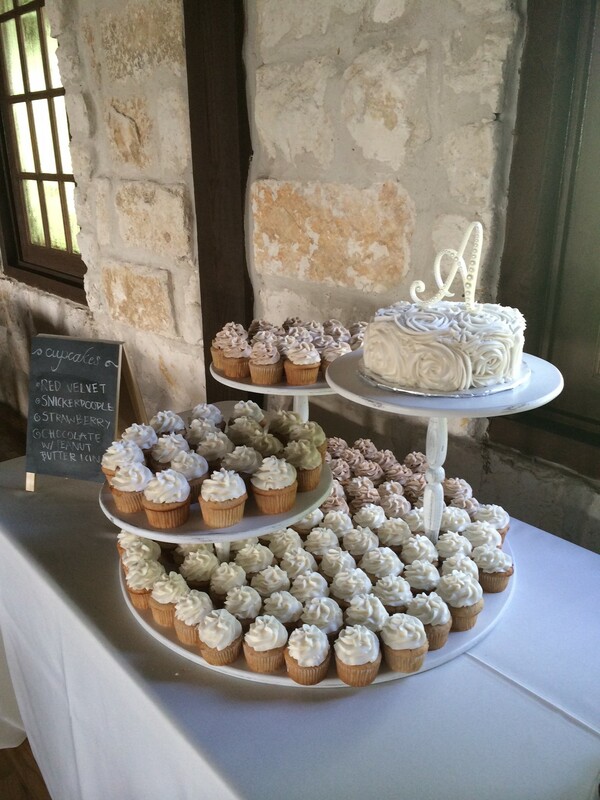 I baked two 8″ cakes and leveled them off. I placed one cake on the large cake board and covered it in buttercream, then fondant. I put the second layer on an 8″ cake board and covered it in fondant as well. Then I stacked the second layer on the first layer, but slightly off center to represent stacked plates. I cut out “Happy Birthday” in gumpaste and adhered it to the two layers. I also added letters and numbers on top of the cake to add some detail of the plate. 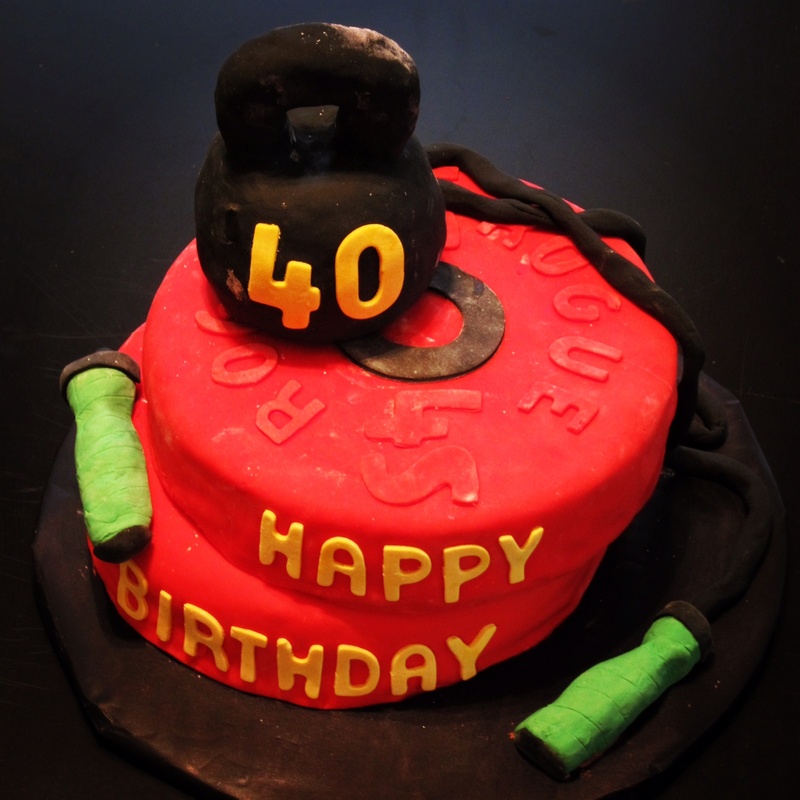 I added the kettlebell on top, glued the jump rope handles with frosting, and added a fondant rope to the handles. I left some of powdered sugar on the kettlebell and the cake because it looked like chalk. That’s it! I love how bright this cake is!